“Precise hard line fades with perfectly polished finishes are taking on a more lived-in look as mass trends shift towards loose texture. This evolution of the barber shop influence finds the hairdresser reconnecting to the classic technique of shear over comb or discovering the fresh approaches of razor over comb and blending shear over comb. 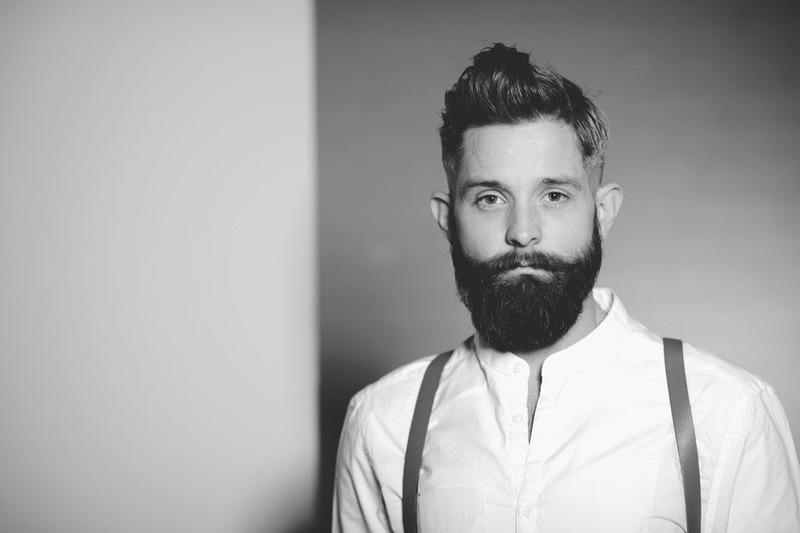 Combine this with matte finish products that coax natural movement from the hair and the evolved pomp is born,” explains Andrew Carruthers, Education Director for Sam Villa. Prep wet hair with a small amount of Redken Brews Get Groomed Finishing Cream as a cutting lotion to allow the shape to develop throughout the cutting process. Part hair at low edge of vertical transition (or parietal ridge) following the shape of the low crown. Using the Sam Villa Artist Series Handle Comb (contrasting comb color to guest’s hair), work a shear over comb technique as close as possible at the hairline building up to about 3/4 of an inch at the parting. Hot Tip: Allow the teeth of the comb to guide the shape. Place the spine of the comb flat against the head at the hairline and then rotate the teeth out away from the head slightly to point towards the desired length. On first pass, don’t worry about perfection, just build the desired lengths. On second pass, switch to the Sam Villa Signature Series Reversible Blending Shear and refine the graduation – this leaves a very soft, slightly grown-in appearance. Part off the top of the head at the highest point of the vertical transition and high crown. Comb this hair into its natural falling position paying close attention to natural hair growth patterns. With the handle comb, pick up the hair using the graduation underneath as a guide for length and comb angle. Place a straight blade into the Sam Villa Signature Series Razor and rapidly slide the blade flat across the surface of the comb. Re-comb the section and take additional passes until hair is removed. Find the desired parting on the top of the head and again comb into the natural fall. Take vertical sections in hand, being careful not to over-direct forward or back from natural fall, elevate to 90 horizontal (parallel to the floor), select a finger angle that maintains the graduation from below and remove hair with the razor. Prep hair with a touch of Redken Brews Holding Gel and blow dry with the Sam Villa Professional Light Ionic Blow Dryer. Use hands to stretch the hair into place and the concentrator nozzle of the dryer to direct hair while leaving a natural finish. With the Sam Villa Artist Series Detailing Comb, again use the blending shear to taper the hairline as close as possible to the skin. Remove hair below the natural hairline with the razor or a trimmer, but do not cut into the hairline to maintain a more organic perimeter. Work a small amount of Redken Brews Clay Pomade through the hands and lightly run hands through the tips of the hair for definition. Finish with Redken Brews Hairspray for a touchable long-lasting finish. Don’t wait for salon guests to ask for the next evolution of the pomp! Become their resource for trend information by educating them on the movement towards textured designs and set them up for success at home by teaching them about the techniques and products that are necessary to replicate the look.